On February 11, the guys will join "90210" star Jessica Lowndes to host a block of programming on the CW. 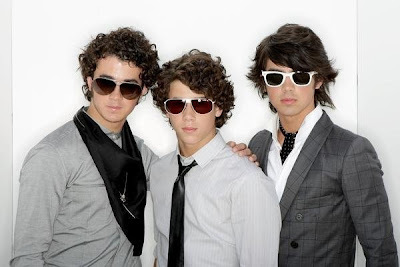 The lineup will include "90210" and "Privileged," as well as a sneak peek at the guys' new flick "Jonas Brothers: The 3-D Concert Experience," out later this month. And if that's not enough for you, the guys will also do a special performance of their new single, "Tonight." Lowndes hopes when the guys find a free few minutes, they'll take the time to stop by the Pit too. "Sometimes we have guest bands, so that would be awesome," she told MTV News. "I hope so!" She added that it was fun to work on the promos with the JoBros, who she describes as "really sweet and down to earth." Then, on Valentine's Day, the Jonas Brothers are slated to be musical guests on "Saturday Night Live," People.com reports; Alec Baldwin will be hosting. It's the first time the band will grace the "SNL" stage. On Sunday, the boys will be performing at the Grammys, where they are up for Best New Artist for their 2008 album A Little Bit Longer. "When you start in a band as an artist you say, 'One day, I'll be nominated for a Grammy.' It happened, and we're just so honored," Nick Jonas told MTV News about the nomination. "As young guys, we know that this is a privilege, and we do appreciate that. We're grateful." NOOOOO! Theres no escaping from the Jo Bros.